On Monday I shared some of our best ideas on keeping kids busy and generally happy while traveling. Today, I’m sharing some of our best toys to bring to use while at your destination. Our vacations for the past several years have been to the grandparents’ houses. We live far away from our families and enjoy using our time off to go visit them, normally for a couple weeks at a time. While there is always a lot of fun to be had exploring and playing outside at both of the grammies’ houses, it’s also important for us to bring some inside toys along with us for rainy days or early mornings (because who doesn’t love to wake up at 6:00a on vacation everyday?!). high level of play: this toy needs to be able to used over and over and over in a variety of ways. Dolls can be taken anywhere and everywhere, and they never really get old. My girls have had their certain favorites at various times over the years– regular ‘ol baby dolls, 18-inch dolls, and mini-dolls. The girls were all about their mini dolls last year because, well, they are small, and small=cute to preschoolers. This year, we’re taking a baby that not only comes along with us outside and in bed and all of that, but it can also go into the bathtub and pool! The Corolle Bath Doll can get wet and dries out quickly (just a little tab to hang the baby from to dry), and it’s a super sweet doll that smells like vanilla. The girls love it, especially Anaya, and they just can’t get over the fact that they can get this cushy baby wet. We also got the chance to review a sweet baby backpack, also by Corolle, to carry our doll in, as well as a slender stroller to push the doll in when we go on our evening walks or just around the house and yard. The backpack is perfect for traveling because then Anaya has a place to put all of her baby’s “stuff”. Anaya has been wearing the baby backpack when we go out, stuffed with her baby’s bottle, diapers, wipes, and extra change of clothes, of course. 🙂 It’s a bit big on her small 2-year-old frame, but it won’t be long until it fits just right! We recently got a set of Picasso Tiles for the kids and this is again, a total hit (these are way cheaper than Magnatiles and are JUST AS AWESOME!). Bonus for this one: Grandma and Grandpa will be so intrigued by these newfangled blocks that they will want to play too! Learning Resources Candy Construction or a Tinkertoy set always comes with us. The kids love building things and constructing with their cousins. It caters to a wide range of ages, and it all fits neatly inside a box. We take a gallon ziplock bag full of favorite figurines to play with outside in the dirt, inside with the building materials, or in the bathtub. We include a variety: princesses, smurfs, minecraft guys, animals, whatever. Playdoh is a favorite of ours, but I’m also sure to have a pack of art supplies that includes markers, a coloring pad, kid scissors, a glue stick, some pipe cleaners, a few pairs of googley eyes, and some stickers. This is the perfect toy for early morning fun. Sometimes I like to include a new coloring book, or a new set of Melissa and Doug stickers. Activity Books that encourage kids to DO something are great for trips. They normally can be done anywhere, and books are so small. Easy to slip into a purse or backpack or underneath a seat. Wreck This Journal Everywhere is one of our new favorites. Keri Smith has created quite a few versions of this DIY art journal. This one is an on-the-go edition, with each page giving some kind of instruction, and by the end of the book, the journal is going to be totally beat up and wrecked. Perfect for kids. 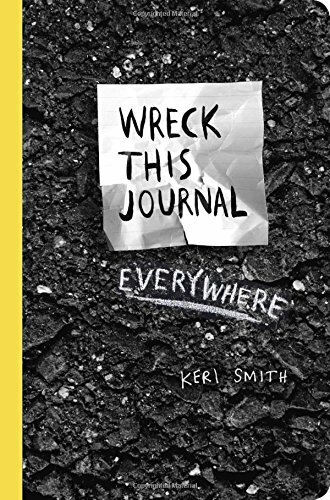 We are bringing the Wreck This Journal Everywhere edition with us this summer, and it has activities like: “Write little notes to tear out and leave for others (in public)” and “Drop mud here. Repeat.” and my personal favorite, “Smush colorful things onto this page.” They have other versions too. Awe.some. What do you bring for your “on location” toys?